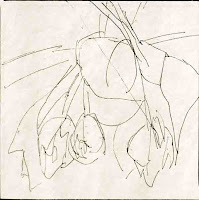 I tried the tulips again the next day, with a more complicated arrangement of the leaves. 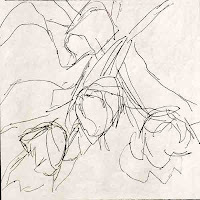 I have also included the quick (as in one minute) drawings I did first in my sketchbook. I like to do these (or value sketches) before I start to paint, especially when I am using an angle that is unusual, like in this case. I view the composition through a cutout of the right shape (a viewfinder) while I am doing the drawing, which is sometimes a bit precarious! In the winter I love to buy flowers. They are so cheerful! Tulips are a favorite. Last year I had lots of trouble painting them, and even have a painting that has a sort of blurry spot where the blossoms should be. But last week, I was determined to give it a go in the gouache. This is my first attempt. I thought laying out the flowers and doing a front on view might be interesting, especially with the shadows. What do you think? Let me start by thanking Liz Fraser and Carol Marine for introducing me to the pleasures of Daily Painting, or in my case "Almost" Daily Painting. In September I went on a wonderful trip to Maine Audubon's Borestone Mountain property in Maine, and Liz was one of the group. While we all did daily paintings on that trip (more about that in another post), Liz has been doing them for some time. I was really impressed. 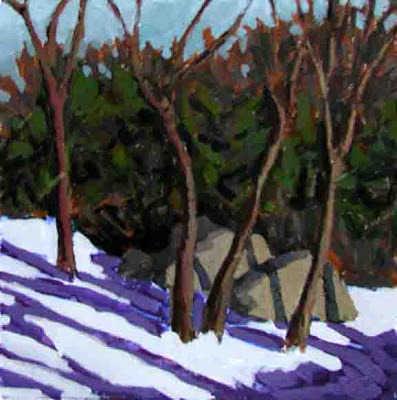 Looking around for more daily painters, I discovered Carol Marine's blog. Following Carol's blog has now become one of the joys of the new day. So what's my approach? 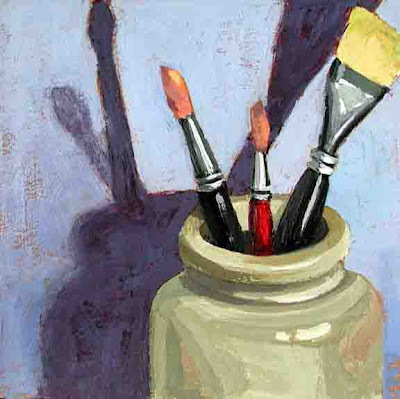 This time of year, I do small paintings, around 5 or 6 inches on a side, and I use a lamp to cast interesting shadows on still life subjects, as described by Carol. But during the week, to simplify painting before leaving the house for a day at the office, I do my paintings on stiff water color paper, in gouache. It is reasonably similar to oil painting, in being opaque, and the colors mix in much the same way (mixing in the white being the tricky part for me!). 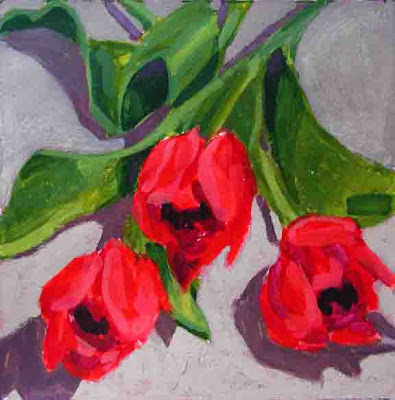 Then on the weekends, I work on studio paintings, or try one of the daily paintings again, but this time in oil. 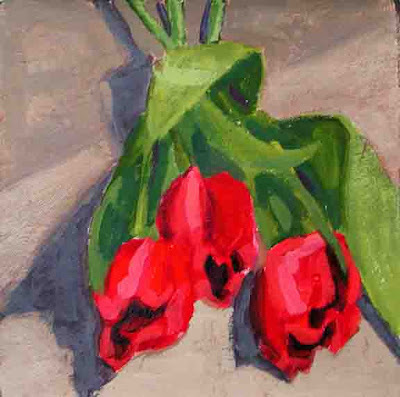 I don't set up the still life again, but do the painting from the gouache version. I have now done this for three weeks, and will start by showing two paintings from the first week. My first try at apples was not too bad, but on the second day, I was not able to paint until the evening. I am not sure if I was tired or it was tough to do in artificial light, but it was a mistake. 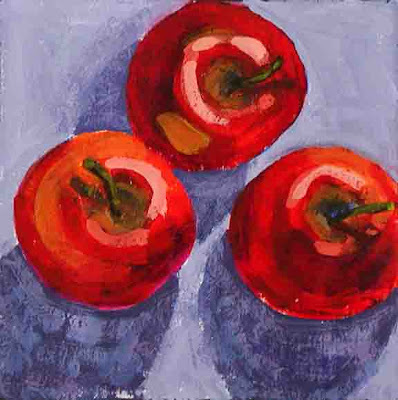 So these are my third apples in gouache, done in the early morning. 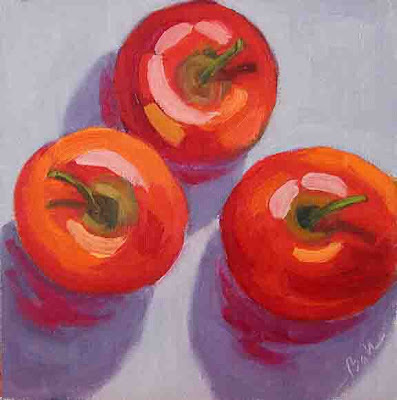 On the weekend, I tried the same view of the apples in oil. Admittedly, it was quite a bit different. The gouache, used inside, dries similarly to oil paint with real turpentine, outside. (I do not use that inside my house!) The oil with Gamsol, which is what I use when painting inside, takes longer to dry and the layers mix more. It took me two sessions to do in oil what I did in one on the gouache version, but I was finally satisfied with the results. And thanks to my friend Michael, for suggesting that a bit of apple color might find its way into the shadow.